In a small bowl, combine the mustard, shallots, garlic, and thyme, along with 2 teaspoons salt and 2 teaspoons pepper. Trim off and discard the wing tips. Trim any excess fat from the chickens, clean out the cavities, rinse under cold water, and pat dry. Set the chickens on a large dish and, using your hands, rub the mustard paste all over the outside (top and bottom) of the chickens. The coating should be generous but not gloppy. Rub any remaining paste into the cavities of the chickens. 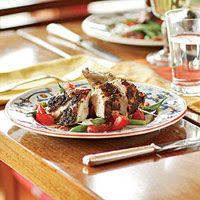 Put the dish in the refrigerator, uncovered, and let the chickens rest, breast side up, for several hours or overnight. Heat the oven to 450 degrees F. Put the chickens on a rack in a large roasting pan, a rimmed baking sheet, or two smaller pans. (If you use two pans and put the chickens on different racks in the oven, be sure to rotate them occasionally during roasting.) Sprinkle a little salt and pepper over the chickens and then drizzle each with 1-1/2 tablespoons olive oil. Roast for 25 minutes. Remove the roasting pan from the oven and drizzle each chicken with another 1 tablespoon olive oil. Reduce the oven temperature to 350 degrees F, rotate the pan, and continue roasting another 25 minutes. Baste each chicken with fat from the pan (use a spoon or a bulb baster). Rotate the pan and roast until the chickens are deep golden brown, crusty, and cooked through, about another 30 to 45 minutes. The chickens are done when an instant-read thermometer inserted in the thickest part of the thigh reads 170 degrees F to 175 degrees F and the juices run clear. Remove the chickens from the oven and let rest for 10 minutes before carving. Carve the chicken, taking care to disturb the mustard crust as little as possible. Arrange the pieces on one or two platters and bring to the table. This entry was posted on 3:54 PM and is filed under Chicken . You can follow any responses to this entry through the RSS 2.0 feed. You can leave a response, or trackback from your own site.